The year is 2034 and we found under the ruins of post-apocalyptic Moscow, in the tunnels of the Metro, where the remains of mankind are besieged by dire threats from outside. Mutants stalk the catacombs beneath the desolate surface, and hunt from the skies outside. We will fight not only for our survival, if not also to prevent the extermination of the human race. 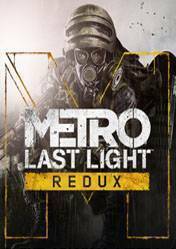 This version is technologically improved in many ways and adapted to the new Next Gen. New lighting, new physics, a lot of new animations and a considerable improvement in the IA, are just some of the aspects of this new and improved version of Metro Last Light. Amazing sequal to the first game Metro 2033. The visual are again stunning but the cherry on the cake is the amazing atmosphere the game has. PLAY THIS GAME WITH HEADPHONES ON!!!! Excellent package and series !